Along with requests for the Asterisk Voice Recognition "Magic Button", I have had numerous requests over the last couple days for the Asterisk Voice Recognition Company Directory (AVRCD). As promised before, I am releasing the source for the company directory. Drop to the bottom for links to a demo and all the source files for the Company Directory or keep reading for details. This isn’t your Daddy’s company directory. My goal in this project was to not only create a voice-enabled company directory for Asterisk, but to also extend the functionality of the company directory in the process. It took over 200 hours and utilizes some of the most advanced web-based technology available for an interactive interface. The AVRCD is tree-based with advanced web-based drag-and-drop technology that lets you drag the extensions you want in the company directory to a custom tree that you create. You can create sales, customer service, marketing, accounting, and whatever other "department" folders you want and have employees specifically in that department folder. When navigating the tree through voice commands, you could for example, say "support", then "Ethan Schroeder" and be connected to me. You can configure each extension to playback confirmations by either pointing an extension to the user’s voicemail name recording or system recording. If there is no audio file selected as a confirmation, the system falls back on text-to-speech using Flite. the IAX trunk through the custom dial string. are getting complaints that "Michael Smith" is getting calls to "Michelle Smith", you can phonetically help the speech engine by writing custom pronunciations for each name. For example, "Mishell Smith" and "Mikall Smith". Lastly, as with the Asterisk Voice Recognition "Magic Button", this project deserves to be a FreePBX modular for integration more tightly coupled with configuration of extensions. In addition, this is a voice only directory. There is no support for dtmf entry for "the first three letters of the first or last name". This functionality is definitely on the todo list, but won’t be useful to accomplish until the FreePBX integration occurs. 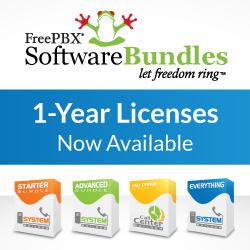 FreePBX needs your support to make things like this a reality, so consider attending the training at the end of the month. The training is going to reach capacity, so hurry up and register. If you miss this one, stay tuned for announcements in the coming month on subsequent training. Next PostFreePBX 2.4.0 – It’s Final!